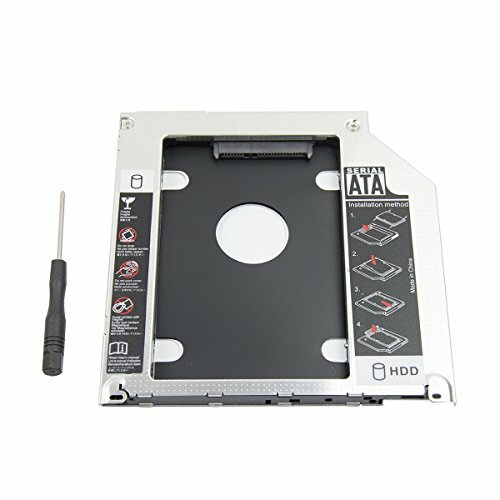 This ia great quality and useful part for upgrade your Apple Macbook Pro laptop to get 320GB/500GB/1TB additional storage space, it could be made part of RAID array and Bootable, even make your Macbook be dual SSD. * If your 1st hard drive is an SSD, you could add an HDD/SSD for bigger storage space. * If your 1st hard drive is an HDD, you could buy an SSD repalce the HDD, then install the HDD in CD-ROM hard drive caddy, so you would get an SSD+HDD assembly, reinstall the system on SSD to Improved your Macbook be surper speed. and almost all models produced in 2009 and beyond which is Unibody & have Optical drive SuperDrive( DVD/CD-ROM ). Note: Item doesn’t fit non-unibody models, Pls make sure your model could fit in by seach answer on Goole or YouTube. If you have any problem with the item, Pls contact us by email.